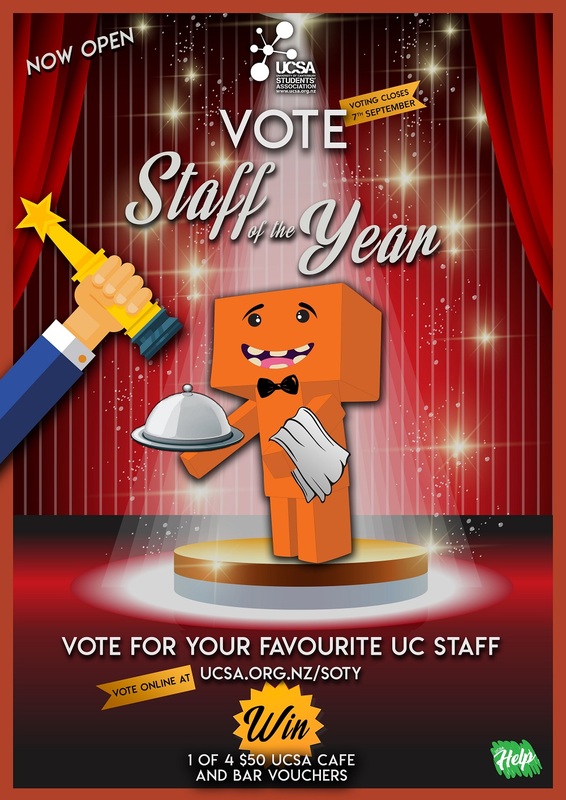 The Staff of the Year Awards give students a voice in nominating/voting for the most inspiring lecturers, supervisors, technical staff, library staff, advisors or cleaning staff who have made your life at UC so much better! You can also make up an award for a staff member of your choice – the cheekiest ones will feature at the award ceremony! Start nominating/voting now! Voting closes Friday 7 September. Staff of the Year Award 2018 nominating/voting has opened! Since 1995, the UCSA Lecturer of the Year Awards give students a voice in nominating and deciding the most inspiring and dedicated lecturers at UC. In recent years, we have introduced nominations for Supervisor of the Year, Administrator of the Year and Great Character of the Year. In 2016, we renamed the event to Staff of the Year, and added a few more awards because we wanted to honour the help and support UC’s non-academic staff members give to students as well. For your enjoyment, there’s still a “Make-up Your Own” Lecturer Award, where you name the award and nominate the lecturer. It’s fun. Plus, the cheekiest ones will be featured at the award ceremony. Start nominating your lecturers, supervisors, technical staff, library staff, advisors or cleaning staff who have made your life at UC so much better! To sweeten the deal, when you nominate someone, you go in the draw to win one of four $50 UCSA Café and Bar vouchers! Please note nominating is voting, no reason for a second survey, make your nomination/vote worth it. You do not need to nominate/vote in every category, but we encourage you to do so. Please fill in as much information as you can for the people you are nominating/voting for. You will have to make a valid nomination in at least one category to be in the draw for the café voucher. Voting closes Friday 7 September – late entries will not be allowed. The Staff of the Year Award 2017 nomination/voting ended last Friday at 5pm. Thank you to everyone who nominated/voted. UCSA had a record number of participants in this year’s voting – a total of 1,197.